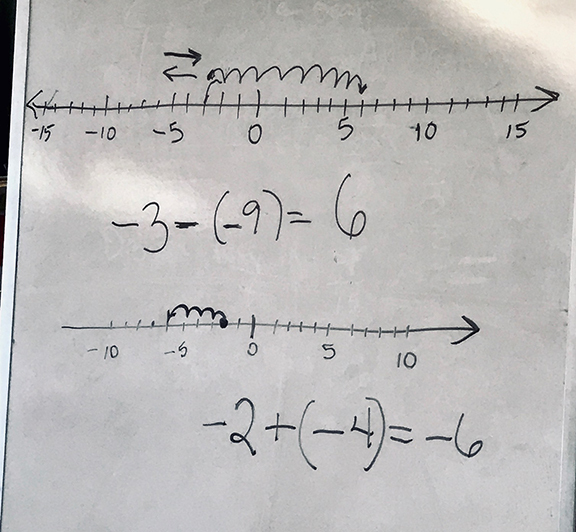 This week, students are working with integers, so identifying points on a number liine, and practicing addition and sutraction of integers and rational numbers with and without a number line. Next, students identified coordinates for points on a coordinate plane, and praticed plotting points. 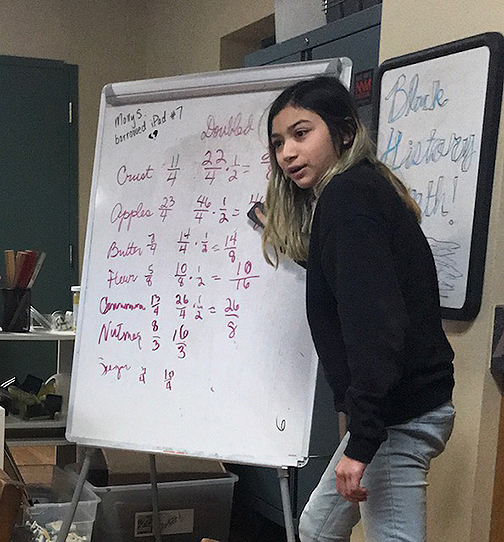 We briefly reviewed coordinate geometry – transformation, reflection, rotation, dilation. We also reviewed translating decimals from words to digits. 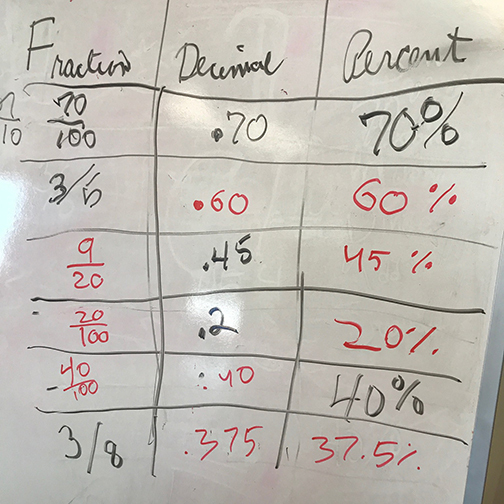 This week, are continuing to practice fluency with fractions, decimals, and percents. 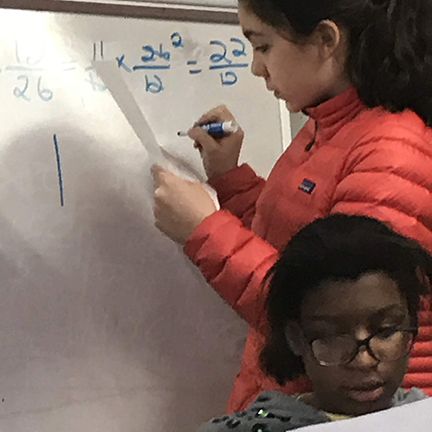 We reviewed the use of area models for multiplicaton, and extended the method to multiply decimals Next, students used area models for dividing decimals. 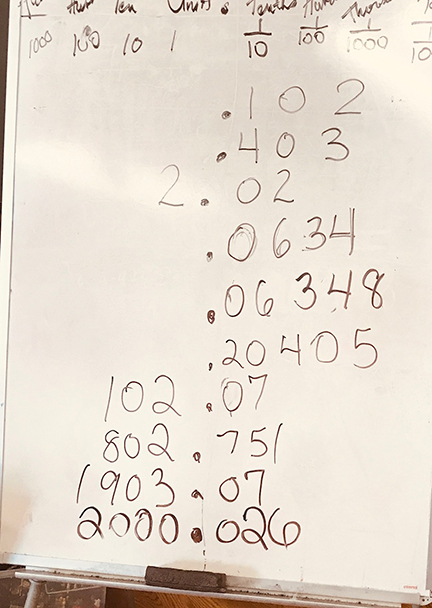 Know that we can decompose a base-ten unit as 10 base-ten units of lower value (e.g., 1 tenth as 10 hundredths) when subtracting decimals. 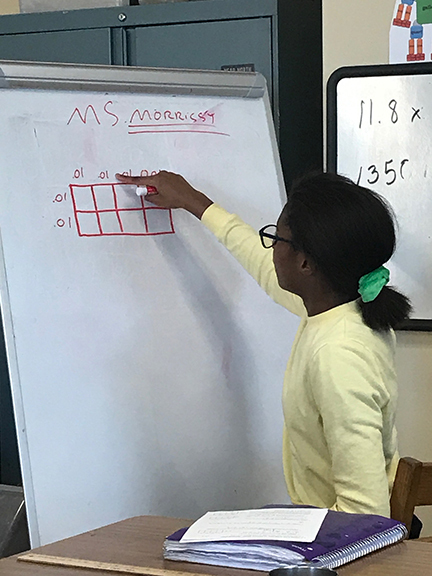 Use vertical calculation to subtract decimals, decomposing base-ten units and writing additional zeros as needed. Understand that writing additional zeros after the last non-zero digit in a decimal does not change its value. 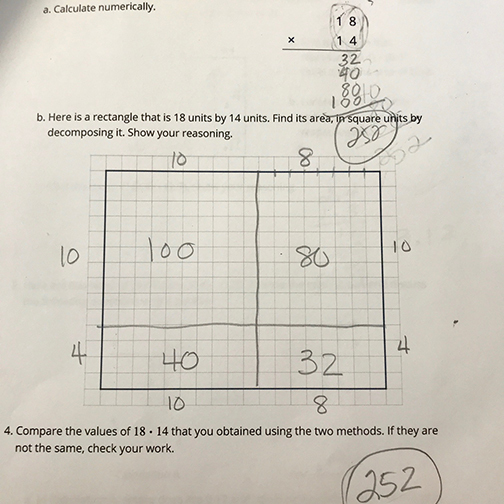 Use area diagrams to represent and find products of decimals. 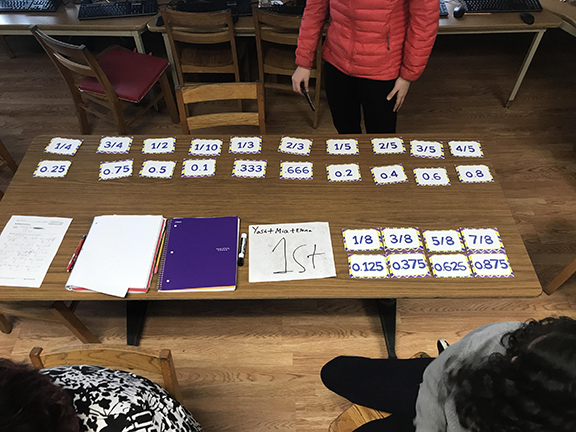 Use understanding of place value and fractions to compute products of decimals. 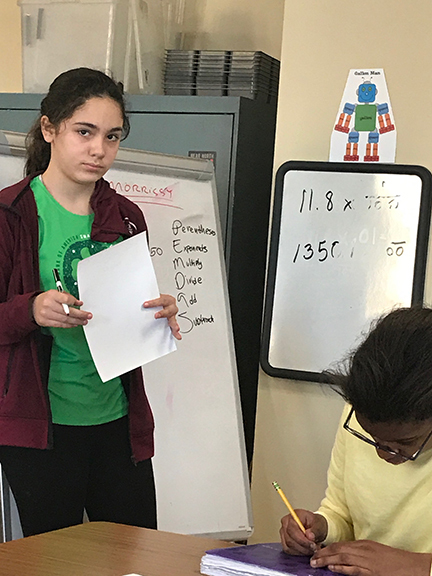 Use an algorithm to calculate products of decimals. Students have completed their Fraction unit, and are moving on to Decimals. 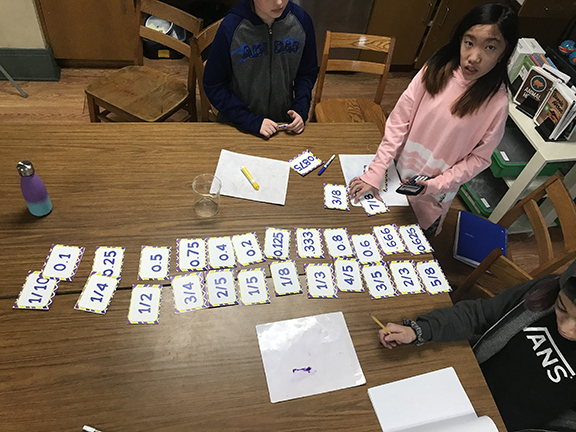 First, they revisit sums and differences of decimals to hundredths, and products of a decimal and whole number. 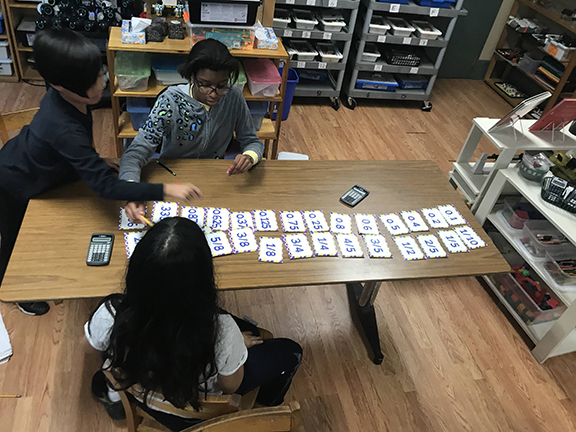 The tasks are set in the context of shopping and budgeting, allowing students to be reminded of appropriate magnitudes for results of calculations with decimals. 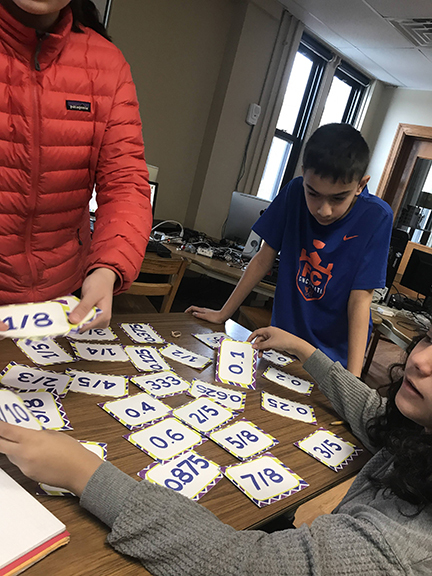 The next section focuses on extending algorithms for addition, subtraction, and multiplication, which students used with whole numbers in earlier grades, to decimals of arbitrary length. 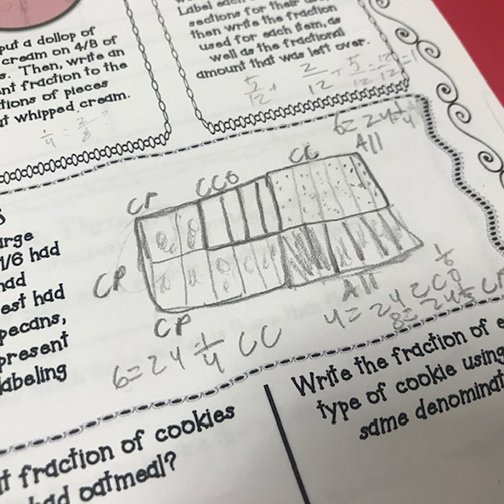 Students will be using “base-ten diagrams,” diagrams analogous to base-ten blocks for ones, tens, and hundreds. These are designed so that the area of a figure that represents a base-ten unit is one tenth of the area of the figure that represents the base-ten unit of next highest value. This week, students took a diagnostic assessment, informing my instruction. Addition, subtraction, and some of the multiplication exercises in this unit will only be covered briefly. 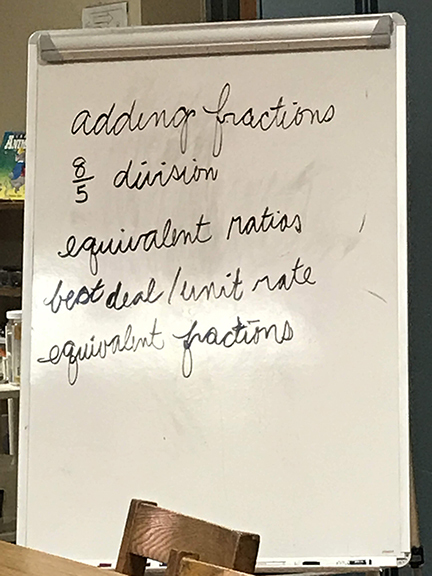 so we can focus on decimal division and word problems. 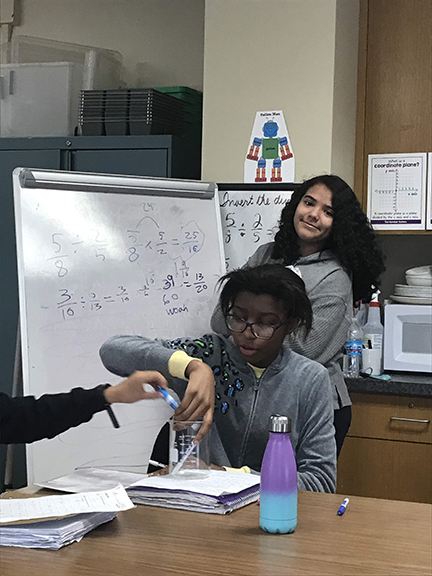 The unit ends with two lessons in which students use calculations with decimals to solve problems set in real-world contexts. 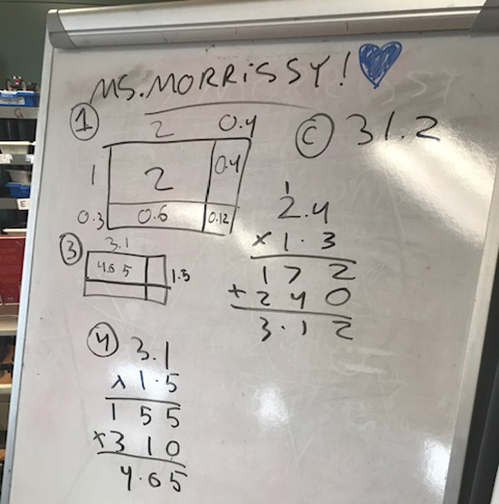 These require students to interpret diagrams, and to interpret results of calculations in the contexts from which they arose (MP2). 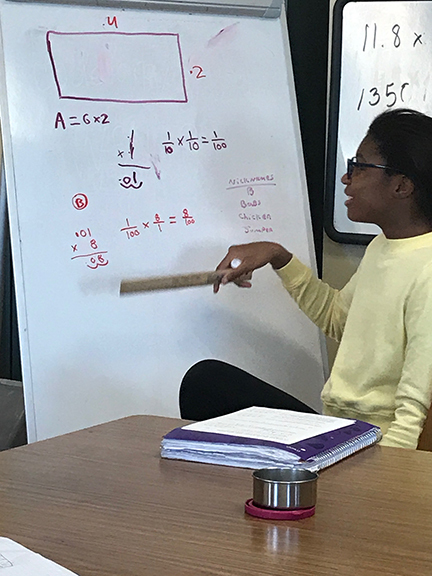 The second lesson draws on work with geometry and ratios from previous units. 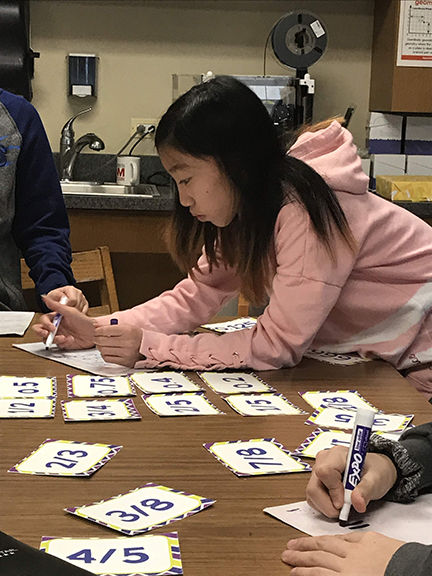 Students fold papers of different sizes to make origami boxes of different dimensions, then compare the lengths, widths, heights, and surface areas of the boxes. 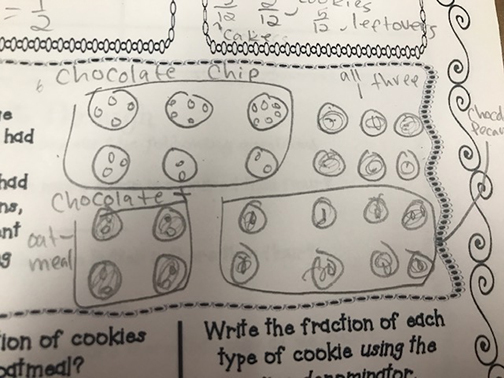 Students are wrapping up their work with dividing fractions, and have DISCOVERED a a method of dividing fractions by using the reciprocal!! 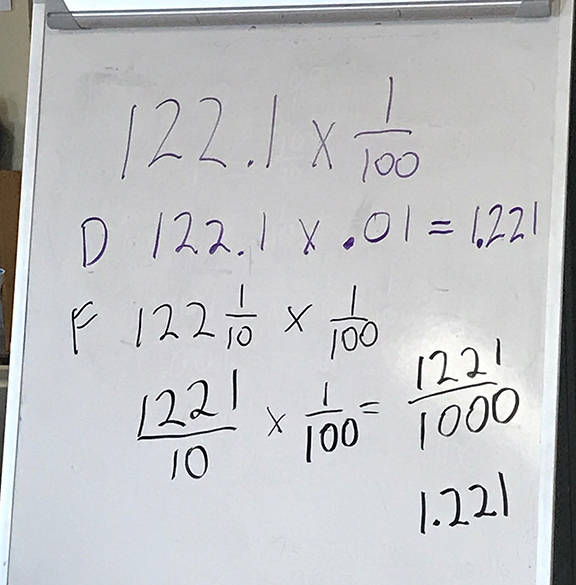 A good place to start building fluency with decimals is to work with some of the most commonly used fractions and their decimal equivalents. 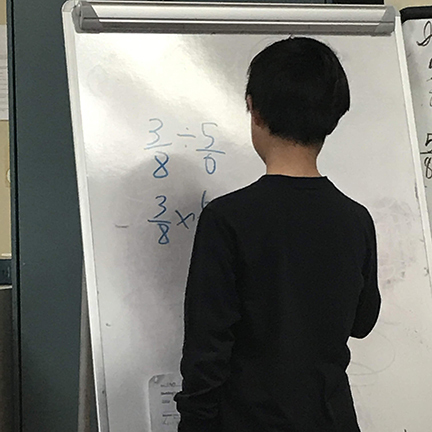 Matching fractions to their decimal equivalents takes a LOT of reasoning, and students are expecting to articulate their reasoning by using words, pictures, and calculations. 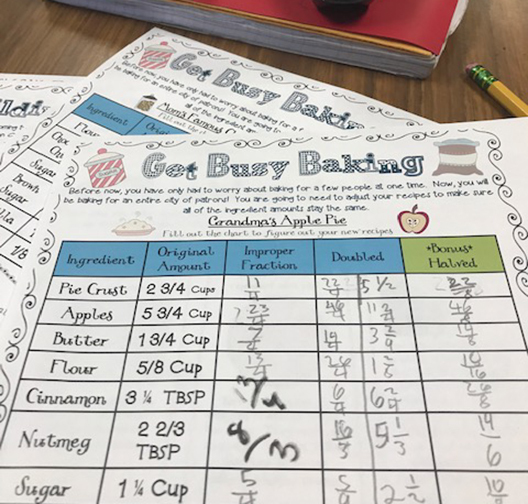 Students have been engaged with a series of fraction explorations, all related to setting up a bakery. 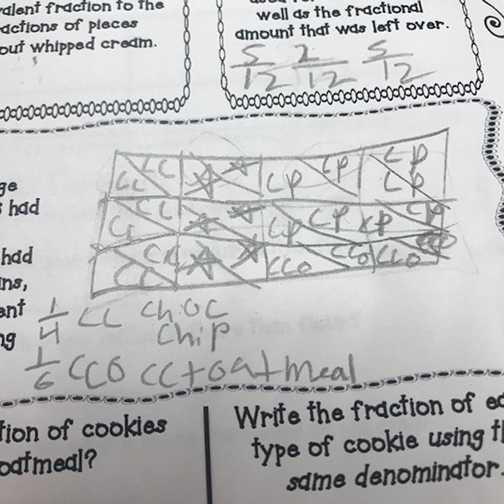 These activities help children make real world connections to fractions, but more importantly, provide them with opportunities to deepen their understanding by drawing diagrams and seeing patterns.